Wash potato and slice into thin rounds. Heat a caste iron pan and add oil. Place potato slices in a single layer in the pan. Meanwhile, toast bread and top with generous amounts of mustard and mayonnaise. Cook potato slices until golden brown on each side, then drain on a paper towel. Layer potatoes on bread, making sure potatoes have cooled enough not to wilt the lettuce. Salt and pepper to taste. 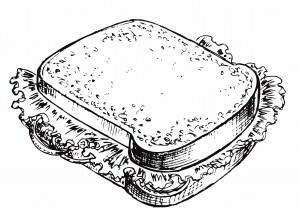 This sandwich should be served with iced coca cola and eaten in front of a T.V. set during working hours.